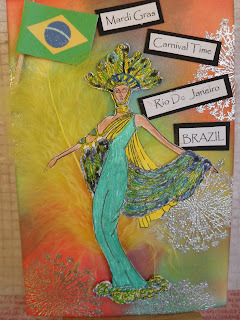 Here we are on our third week of Darcy's Postcard Challenge 2012,( see on side bar) and we are in BRAZIL. I knew immediately which stamp to use for my postcard, my carnival dancer from Rubbadubbado. I started by colouring the background with TH Distress inks in bright carnival colours. I used a dandelion stamp, embossed with Silver Bells Wow! powders to look like fireworks. I coloured my dancer in the colours of the Brazilian flag. My OH suggested Motor Racing, son said football. I think not. I love the glitter, the feather and bling on this. 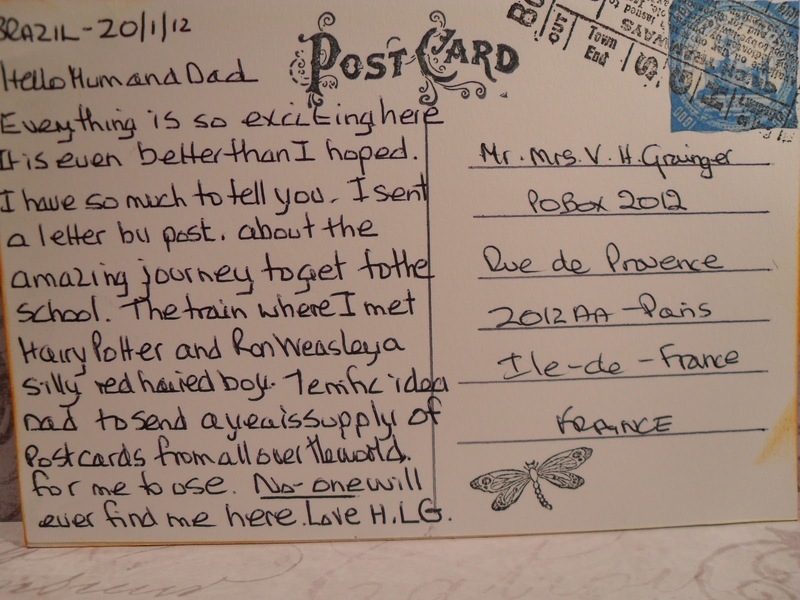 ﻿My postcard, above, from Hermione to her parents, which is always posted to a safe house PO Box, where it is collected by a courier, who then delivers it to where her parents actually are. I am enjoying our adventure around the world each week as Hermione and her parents communicate with each other I am getting to know more about them, you'll be amazed how much more there is to be known about all three, time will tell. I am still having commenting problems with IE, sadly I can not access every page to leave comments on those who are taking part in Darcy's challenge. I am leaving comments where I can. Sorry Darcy, I can't comment on your fabulous dancer either, nor to let you know how much I am enjoying this weekly challenge. Thanks. gorgeous card, inspired use of the flower stamp to make fireworks!! The card is lovely and it's about Harry Potter ! Big points there from me! Love love! And what a great idea from her dad to cover where she is. Terrific card! Great artwork. Look forward to next weeks instalment. A wonderful postcard, love the background colors. 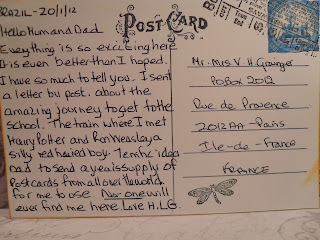 Love your continuing story, the postcard is fabulous, love the lady. love your card. the colours are beautiful. I am too having trouble with leaving comments, its such a shame as I would love to comment on other peoples blogs..
Wow! Love all the work you did on this card. The colors are gorgeous. I'm having trouble with IE too. I switched to Chrome and it works fine. This is lovely. Hermione will be able to spell these home soon! Fabulous zingy colours, your carnival queen looks so good and great idea for the fireworks. Fabulous card Caz, love your fireworks! what a great idea. Fabulous lady and design. Great card. Great postcard! 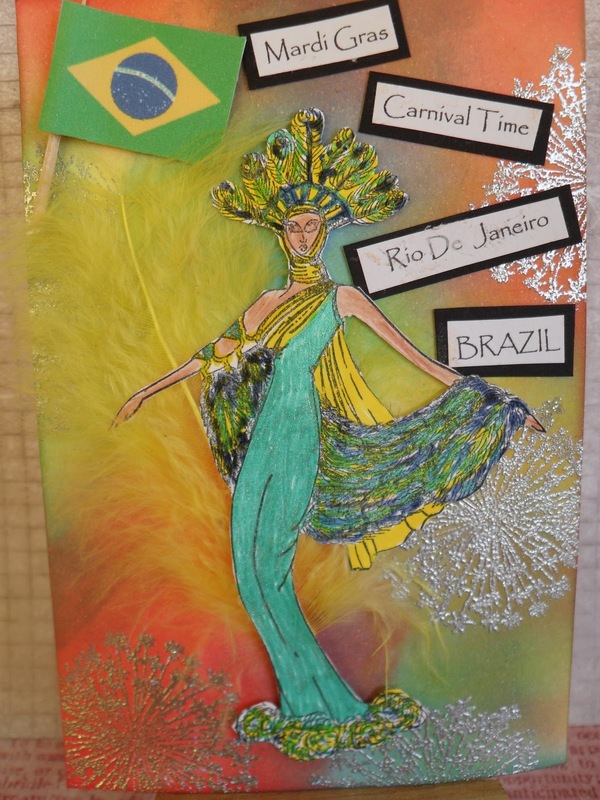 Love the colours and the Carnival dancer! Great postcard from Brazil, look forward to the next! I'm loving the colors of the background. Great card and great story unfolding.